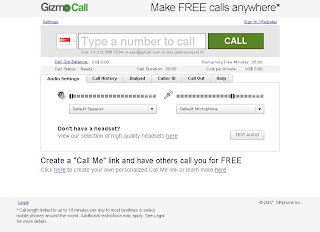 GizmoCall a SIPphone service has launched a new web-based voice-over-IP (VoIP) service that will allow users making phone calls directly from their web browser. It all based on Flash. I wonder how many other websites do that. It doesnt seem Jajah used Flash. However, I am not able to find any real difference in using Flash Plugin to make a call. I will do some study and testing and will post some results. Back to the news, The web based interface allows the users to enter the enter in international format such as (+12221112121) and then click Call. If you dont have a flash plug-in installed (first time users), then it will ask you to install the plug-in. Just install and it will automatically recognise it. Then the call is sent out to the number you wanted to call. You need to use headphones (or speaker) and mic to talk. According to the website, Users get five minutes of calling per day to just about any phone number and can double that if they register with an email address. For more calls, users can purchase Call Out minutes. Besides PSTN phones they can call for free google talk users, Windows Live users, Gizmo Project users and any other SIP address/device. 4. You'll see, at first, only the remaining time you had before registering. 5. Sign in, the audio setup wiz. will start again. 6. When done, it gave me another 10 minutes! Here's a free music player that lets you create your own "radio station" from a library of songs featured at the site. This feature is provided by Radio Tornadostream who not only lets you create your own radio stations but also to share with your friends, or post on your blog, myspace page or personal web site. Oh and also... it's free. Tornadostream, a multimedia company from Salt Lake City, Utah that specializes in streaming media of all types. Jesse Harding, co-creator of the tool says he and Dan Smith came up with the idea while trying to find a convenient way to share new songs they had discovered. And moreover You don't need to install anything. All that is necessary for calls - headset and sufficient bandwidth of your internet connection. Never before the IP-telephony was such simple and accessable. By the way do post in your views in the comments below. 1. Writing scraps in reverse - Add & # 8 2 3 8 before your scrap without spaces in between these characters. The whole text will get reversed on submitting it. Isn’t It Cool. 3. Writing a star in your orkut scrap - Write & # 9 7 3 3 before your scrap without spaces in between these characters. And see a cool star icon that comes up in the scrap on submitting. This about orkut proxy could be used if your network administrator have blocked access to orkut.com and you get an 'access denied' message. Exclusive Offer, enter coupon code: 50PROMO and get 50% off for your first payment whether first year or first month. Coupon works for virtual and dedicated servers! VR has full managed, high-quality, low-cost VPS servers! All of our servers feature Quad Intel processors with ECC Registered RAM and 300MB/s hot swap SATA II drives with a hardware RAID controller configured for RAID-5 for superior performance and fault tolerance. Our exact hardware configuration changes every 3-8 months to keep current with technology and the market. All VPS is with FULLY MANAGED 24/7/365 FAST SUPPORT. Use "HGC25" to get straight 9.94$ off !!! Rack111.com is a company created to offer free hosting services for everyone on the internet. We offer advanced free hosting services at no cost, including HTML, PHP and MySQL hosting. if you want a free rapidshare account just subscribe/follow this blog and leave your email id and the name with which you subscribed..
on your twitter profile and you will get 0.01-0.10 $ per click. minute and it will work for you till the limit has been reached. To auto-follow users you can also use hummingbird. Step 4) Wait for people to follow, or rinse and repeat. and get it FREE for the first year with no further obligation (a $35 value). just go to ovh and register a domain remember you must be a uk resident to register because they send you an activation code by sms. and one more thing you can register unlimited domains there. This is a free Blackhat trick on how to register Free .COM Domains. If you like this share,reps are appreciated. Step 1: Well the first thing you need is SEO for Firefox or the SEO Toolbar, they are pretty simple easy to install just Google it for download link. Most of you should already have one of these plug-ins installed or something like it. If you do you just ignore this step. Step 4: Once you find a blog that allows you to comment with no moderation, well its pretty simple comment on every post. Just in case I mix up the name/keyword up a little so it doesn’t look like I’m spamming. Step 5: This step is the most important, you have to ping it. Most of this blogs are buried deep into the website so if you don’t ping it Google well never find it. Note: The same can be done with but .gov it’s allot harder because less people have .gov links. There you go, you have some .edu link’s I know this isn’t the easiest way to get links but you have to mix it up. Just having a couple edu links well help your blog out allot not just because the .edu links them self’s but because Google well disvalue your links if there not mixed up and scattered all over the place.